Bar Ciccio is the kind of place you could walk by a million times and never notice. It’s located on a strip of 6th Avenue that gets ridiculously minimal intentional foot traffic and the shop front is so understated that you probably wouldn’t even realize it’s open for business. 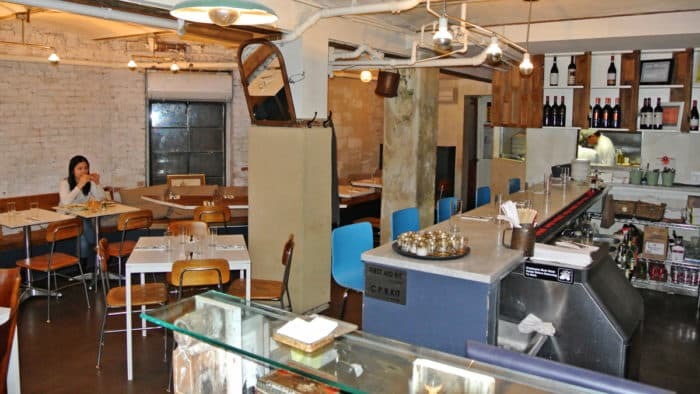 In fact, the place is completely subterranean and is located down a flight of stairs frequently obscured by scaffolding, but to miss this truly authentic Italian joint would be a big mistake. On my return trips to New York, going out for quality Italian food seems to have become a thing for me. It is seemingly one of the most challenging ethnicities of cuisine for the generally diverse and impressive San Francisco dining scene to nail. 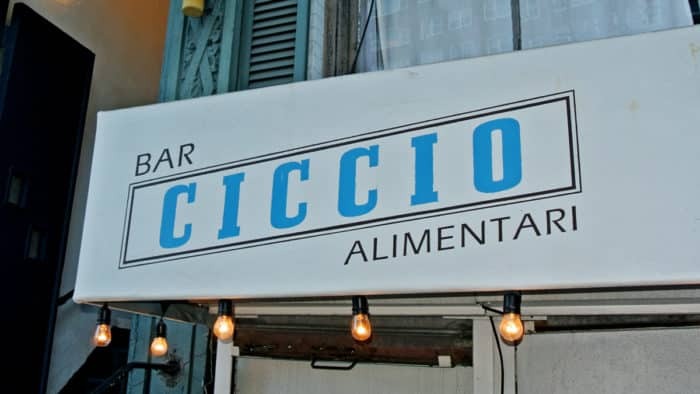 But, on this particular day, I was beyond hungover from the previous night’s Holiday Party festivities and absolutely needed a lunch full of soup and carbs near to my West SoHo office to fix myself up and Bar Ciccio seemed to be a perfect fit. My buddy Corey and I grabbed a table at this super-cozy, quiet restaurant and both selected a soup and half sandwich combo as our meal. 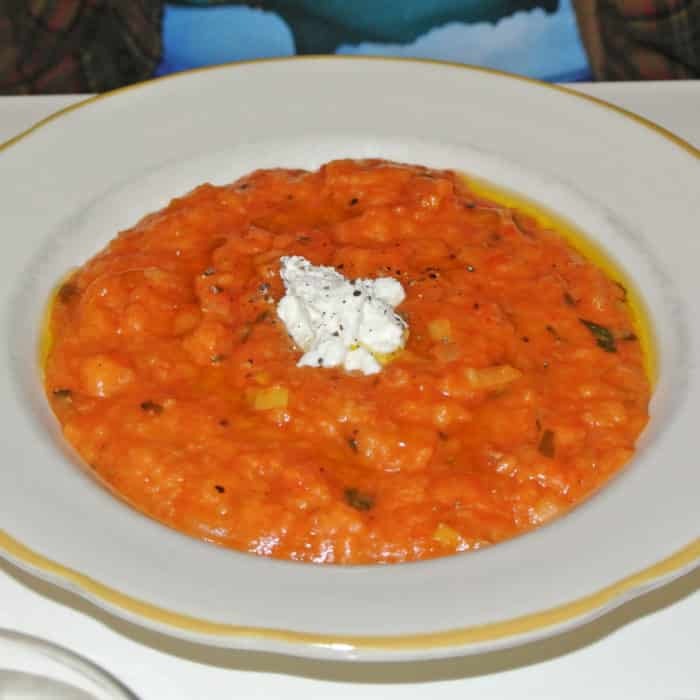 He selected a soup called Pappa al Pomodoro – a unique take on the classically comforting tomato soup. He let me sample a spoonful of his Tuscan tomato soup and I was struck by its bizarre and interesting texture. This hot soup was laced with basil and topped with fresh ricotta, but what really pushed it beyond was that it was full of tomato sopped bread. It felt almost more like a creamy thickened sauce than a soup, but it was absolutely delicious in its own right. 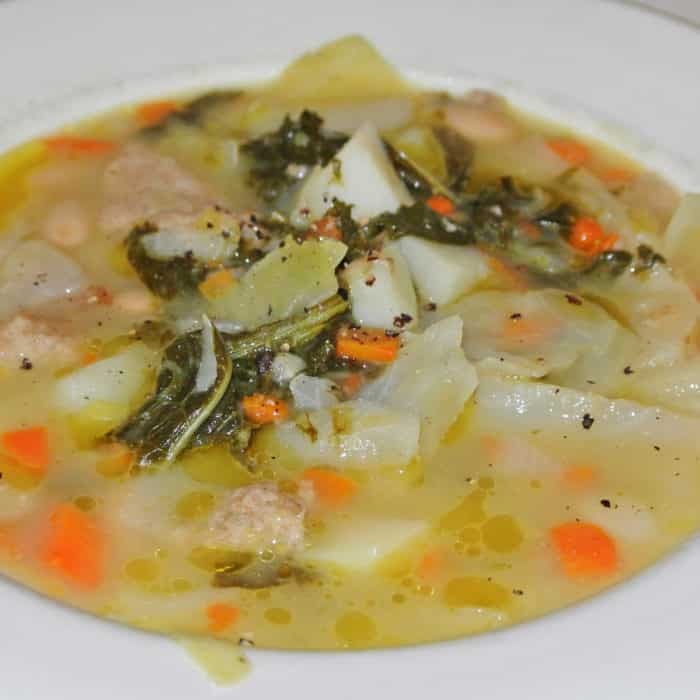 I selected the other soup offering called Ribollita which seemed like a perfectly comforting dish to soothe my ailing body. 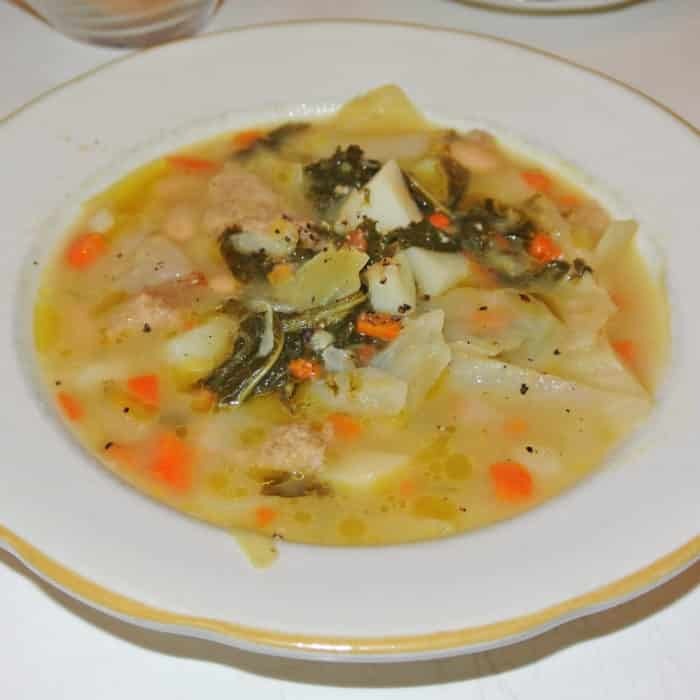 It was a brothy soup full of cannellini beans, kale, spinach, cabbage, olive oil, and once again hunks of broth-soaked bread. The flavors were indeed very soothing and really hit the spot with their vegetal lightness. The soggy wheat bread added an unusual, but very pleasant and unique textural touch to what might otherwise have been a seemingly simple vegetable soup. Simple maybe, but the flavors were certainly full of complex subtleties that I loved and appreciated. 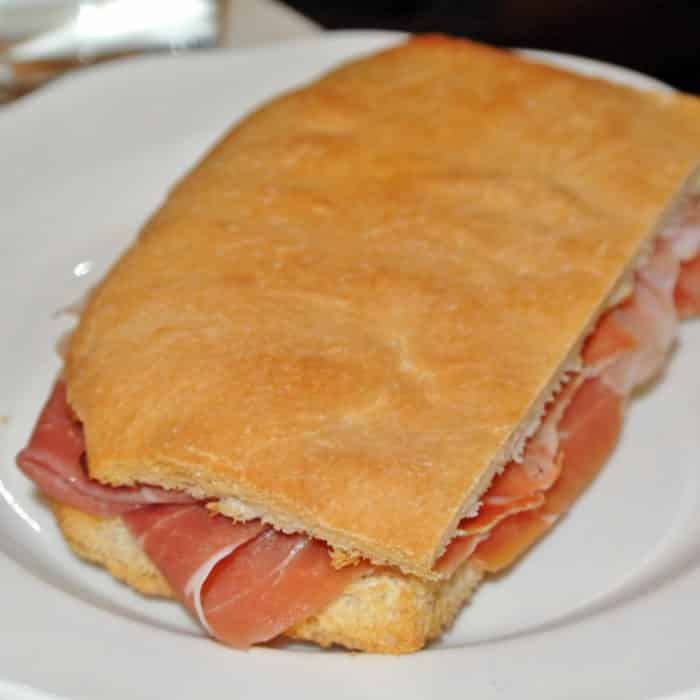 As my half sandwich, I selected the Prosciutto Crudo e Pisellini Schiacciata. Schiacciata, apparently, is a Florentine style focaccia and it was really the element that made this flatbread sandwich incredible. It was a bit crackly on the outside and very light, fluffy, and airy on the inside. 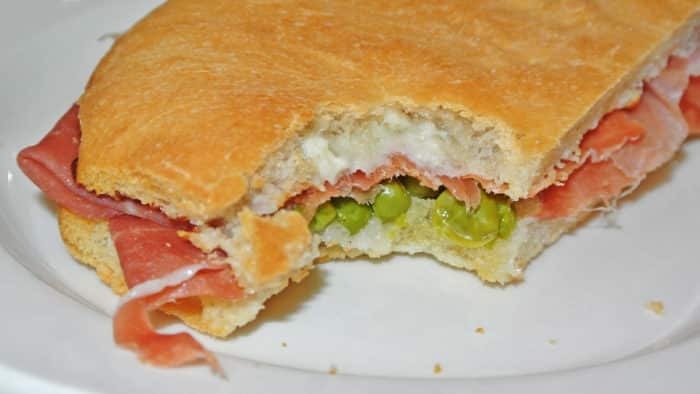 The layers of bread paired really nicely with the high-quality prosciutto and was interestingly spruced up by a vegetal layer of green peas and cheesy parmigiano cream. This was a delicious and very well-made sandwich and I even felt that the “half” portion was more than generous compared to the meager half-sandwiches I’m used to finding elsewhere. So, now I’ve got another reasonably priced NYC Italian restaurant in my arsenal. Bar Ciccio made for a perfect hangover-curing lunch spot and seems like it would also serve as an excellent date night dinner pick as well. I can’t wait to return and eat my way through the rest of their dinner time menu. 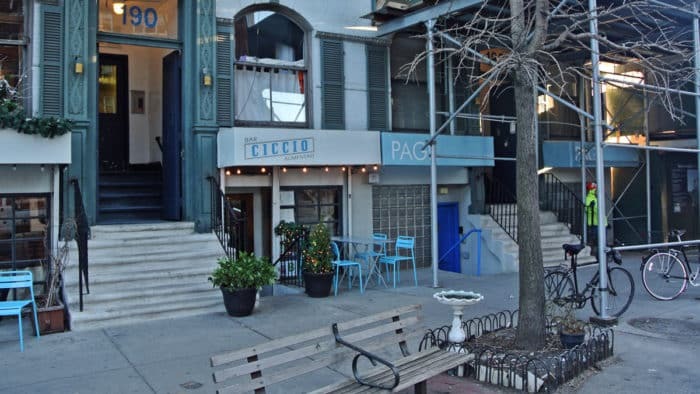 Got another great, cheap Italian spot I should check out in NYC? Let me know in the comments below.